The rear portion of this dog’s body seemed paralyzed. The tiny, little dog was supporting and dragging herself around with only her front legs. Areas on both of her back legs had been badly injured due to having been dragged along the ground for so long. 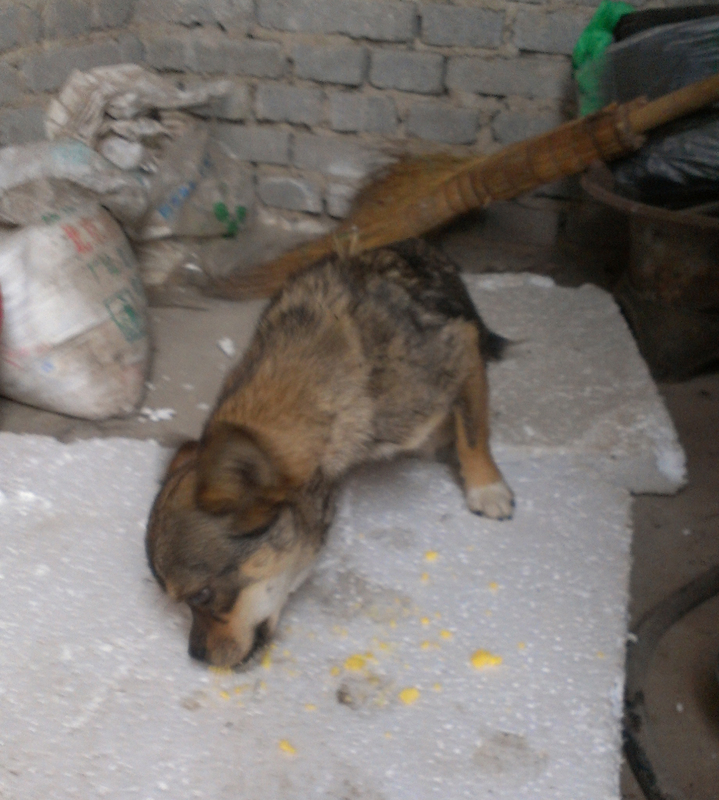 She was extremely skinny, dirty, and hungry, and yet so eager to be petted… Xiaoli temporarily placed her in the backroom of the site’s cafeteria and then found some eggs to feed her. This poor little thing inhaled SIX eggs and drank a HUGE bowl of water! Xiaoli could not imagine what this dog had suffered through and how she had made it this far. Xiaoli took care of the dog for a week at the construction site where she was working while she set up a fundraiser for the dog. The story of this dog quickly received much attention and compassion from many loving and caring individuals. Through an online campaign to save this dog, Xiaoli was able to raise over $600USD for medical treatment for his injuries. 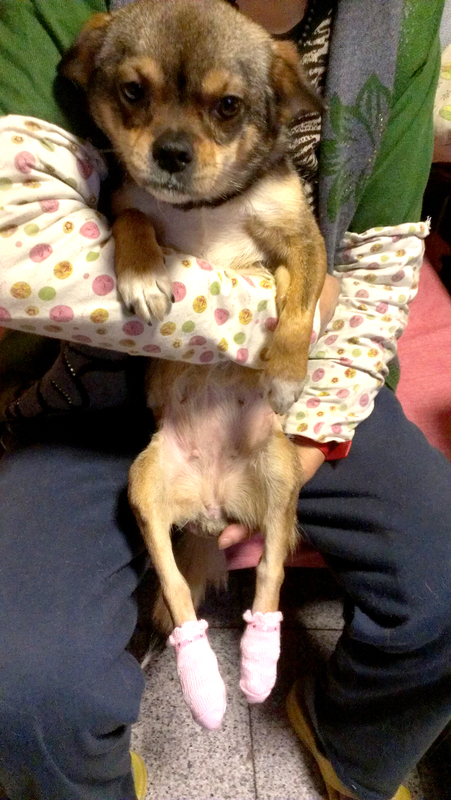 The dog was also received the lovely name “WangWang”, meaning “Hope” in English. After an examination in the animal hospital, it was discovered that WangWang’s thoracic spine had been fractured so badly that it had shattered into many pieces. Her injuries were believed to be have been caused by blunt force trauma. For a long time, Xiaoli wondered what kind of sick and heatless person would have hurt a fragile and defenseless life to this degree. Later, she found out the person who did this to WangWang was an elderly guy who also happened to be an employee of the very same construction company where Xiaoli worked. Apparently this man saw WangWang playing in an area near the construction site where he had planted some vegetables. He became angry that she had damaged some of his plants, so he hit her with such force that he broke her spine. He then tells that he stood and watched as she could not run but only drag herself away from him in fear. Xiaoli couldn’t press any charges against this demon and his cruelty to WangWang because there are no animal cruelty laws in place in China. What this man did, however, outraged many animal lovers in China. An online mob formed, and they demanded to know his information so that they could initiate a public condemnation and possibly retaliation against this man. Xiaoli, however, decided not to take any aggressive actions against this man. Instead, she chose to spend her time and energy providing WangWang with the very best quality of life and as much love as she possible could. 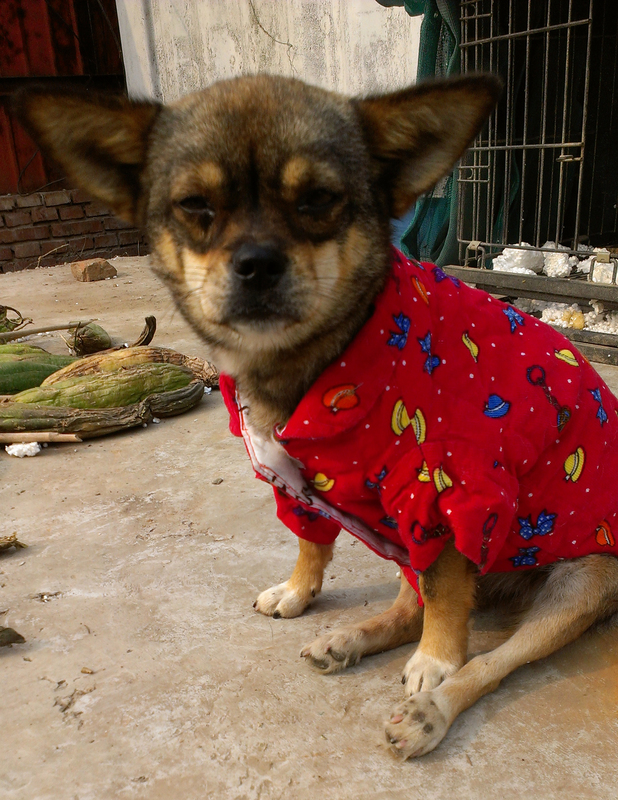 With the help of the donations, Xiaoli was able to get WangWang’s injuries treated. She underwent surgery and a titanium rod was placed into her spine to stabilize the fractures. Unfortunately, however, she will be permanently paralyzed and never again able to use the rear portion of her body. In spite of the terrible misfortune and injustice of WangWang’s injuries, she is now living a life with more love and comfort than she had ever previously known. 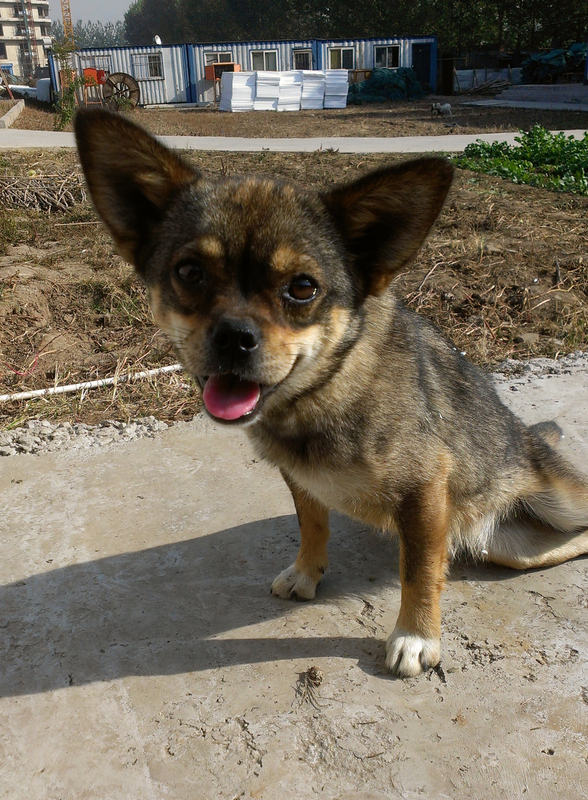 She currently lives in Xiaoli’s shelter with other rescued animals. WangWang has been using a used doggie wheel chair to move around. Although WangWang has been rocking around with her ride, the wheel chair is unfortunately too big for her. It is also not terribly well designed or built. Xiaoli has been having a hard time finding a good replacement or a company that makes high quality doggie wheel chairs in China. This poor little thing has already been through so much pain in her short life. She has lost the use of half of her body because of the cruelty of men. The least I can do is to provide the most comfortable and joyful life possible from here on out. 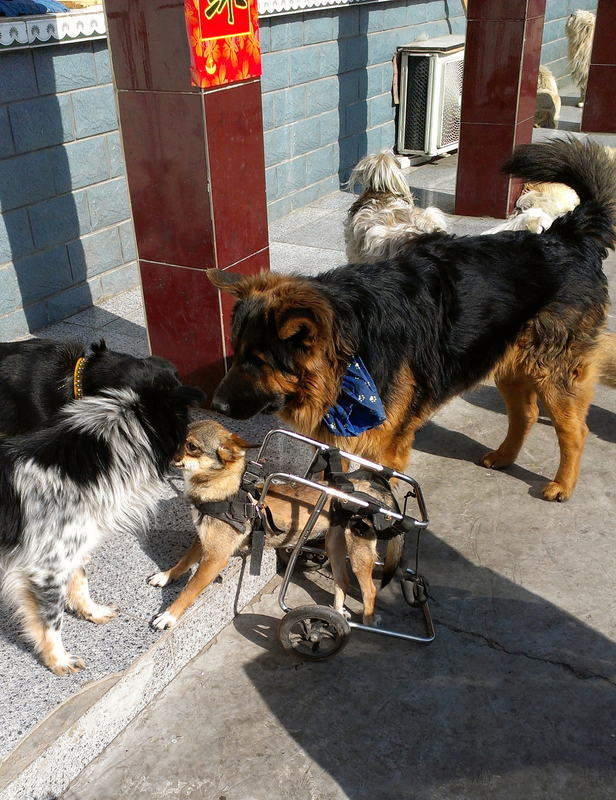 Xiaoli has asked for help in finding the best possible wheel chair for WangWang from America, which thankfully has several good companies who specialized in making custom doggie wheel chairs. WGAPC is honored to be entrusted with this mission and is going to help Xiaoli to give WangWang a future where she can run free and strong! You can help, and we need your help! Please join WGAPC facebook page to follow and be part of this mission! Thanks so Much for saving this sweet,poor dogs.You are a hero and angel. I love WangWang. Thank you for saving her, loving and fighting for animals. This story is just beautiful – such a heart of love and dedication has Xiaoli for improving the wellbeing of animals in China. I am so glad that people like her also live on this earth for without them, this planet would be a living hell. I am so happy to hear that little Wang Wang has a much better quality life now and that she is given much love and care at Xiaoli’s shelter because her life before was full of sadness and pain. I am so glad that she was adopted by Xiaoli and saved from a terrible fate. 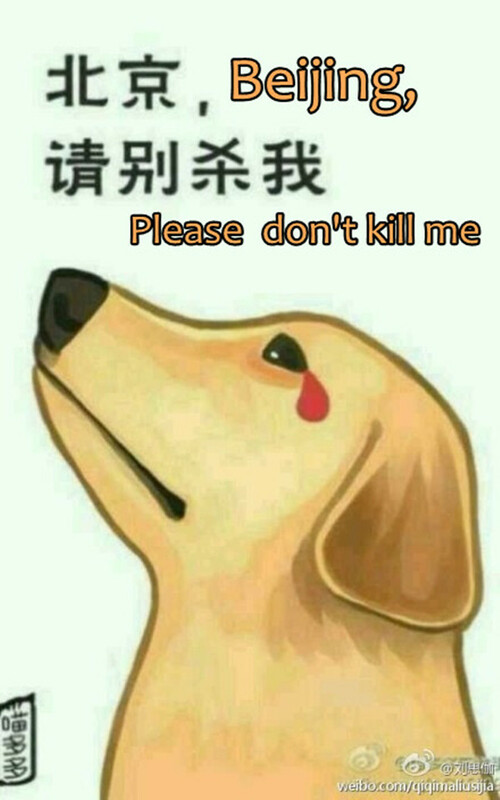 I am really praying in my heart that Xiaoli’s mission to help and rescue injured and stray animals will be blessed so mightily and that through this many lives will be spared needless suffering. Wow. I can’t believe that guy. Xiaoli is truly an amazing person to forgive that man, and not share his name with that mob. I would not have been so kind. It’s a well known fact that people who hurt animals are also likely to do the same to people — for example, serial killers always start by killing and torturing animals first. Firing the guy would likely just make him want to retaliate by hurting every dog he sees…so I probably would have turned that guy into a vegetable, so he could never harm any living thing again. Let him try to drag himself around with his chin after he is a paraplegic.